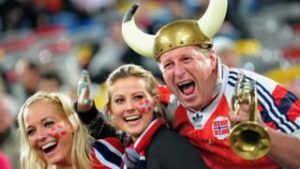 Norway is the happiest place on Earth, according to a United Nations agency report – toppling neighbour Denmark from the number one position. The World Happiness Report measures “subjective well-being” – how happy the people are, and why. Denmark, Iceland, Switzerland and Finland round out the top five, while the Central African Republic came last. This year’s report also contains a chapter titled “restoring American happiness”, which examines why happiness levels in the United States are falling, despite constantly-increasing economic improvement. 1. Have you ever heard of HYGGE (hoo-gah)? It means relaxing and enjoying life’s simple pleasure especially with friends and family. It is what “happiness experts” say we should learn from Denmark and its neighboring happy countries. What are some of your life’s simple pleasures? 2. As further analyzed, it has been said that the United States’ falling happiness is more of a social issue rather than economic. Can you name some of the social issues in the US that you are aware of? 3. Imagine a ladder, with steps numbered from 0 at the bottom to 10 at the top. The top of the ladder represents the best possible life for you and the bottom of the ladder represents the worst possible life for you. On which step of the ladder would you say you personally feel you stand at this time? “The United States can and should raise happiness by addressing America’s multi-faceted social crisis – rising inequality, corruption, isolation, and distrust – rather than focusing exclusively or even mainly on economic growth,” the authors said.